Campylobacter jejuni virulence is based on its ability to adhere to and invade effectively into the host’s intestinal epithelial cells. This is enabled by various outer membrane adhesion factors, including MOMP (Major outer membrane protein) and CadF (Campylobacter adhesion to fibronectin) . The flagellum of C. jejuni is also crucial for the infection pathway, as it is responsible for motility and helps the bacteria to invade into the host cell . Additionally, the flagellum was identified to serve as a type III secretion system (T3SS), which can deliver different proteins into the extracellular milieu or even inject some of them into the host cell to support pathogenicity-associated processes [11–15]. One factor secreted through this T3SS is the Campylobacter invasion antigen B (CiaB), which is a 73-kDa protein proposed to be involved in the invasion process of C. jejuni . Moreover, some other proteins, including virulence factors, are secreted as cargo in outer membrane vesicles (OMVs), which are continuously shed by the bacteria . For C. jejuni, 185 proteins were found to be delivered into the environment by OMVs . 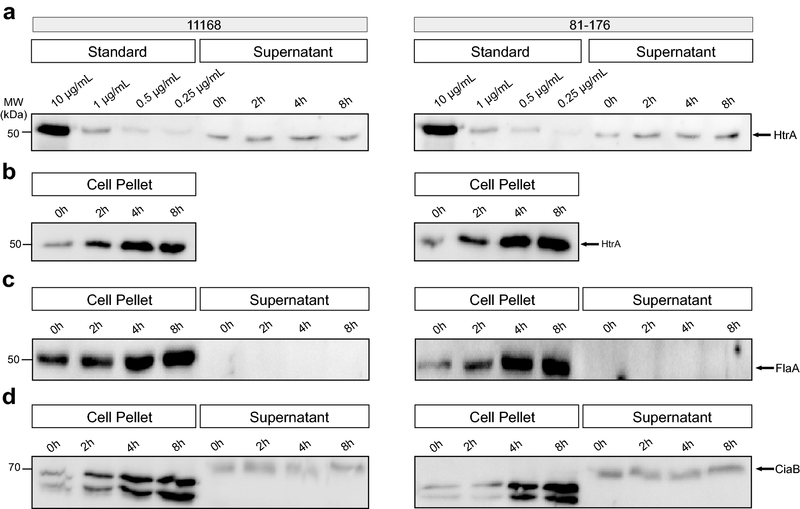 However, these proteins were only analyzed in a qualitative manner, while none of them has been quantified yet. Another important virulence factor of C. jejuni is the serine protease HtrA (high temperature requirement A) [18–21]. 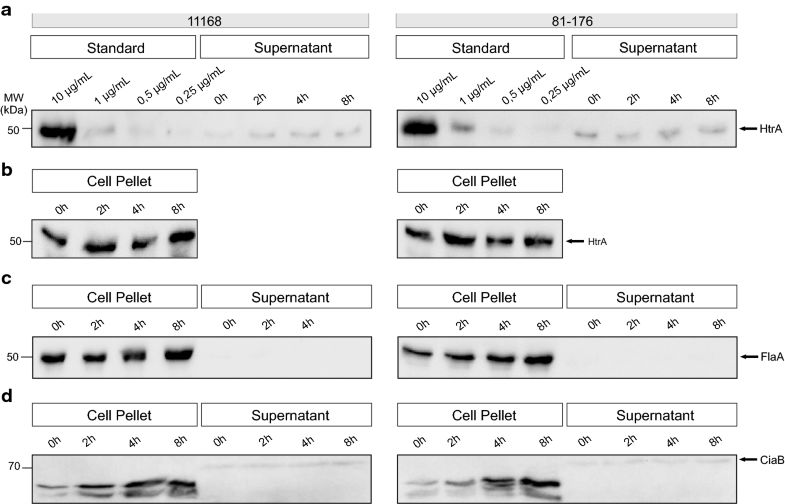 HtrA proteins are highly conserved in many different pathogens and are crucial for survival during stress conditions [22, 23]. For example, in C. jejuni HtrA plays an important role in heat tolerance and oxygen resistance . Most HtrA orthologs consist of a signal peptide, a trypsin-like protease domain, and one or two PDZ domains for protein–protein interaction . The HtrA proteins are usually located in the periplasm, where they act as proteases and chaperones, but C. jejuni and its close relative Helicobacter pylori are able to secrete HtrA actively into the extracellular space [19, 25, 26], in a manner independent of the flagellum . It appears that secreted HtrA helps the bacteria to transmigrate across the epithelial cell layer in the gut by cleaving the surface adhesion protein E-cadherin, which can at least temporarily open cell-to-cell junctions [19, 26]. It was shown that deletion of the htrA gene leads to reduced E-cadherin shedding and to impaired transmigration of C. jejuni across polarized epithelial cells in vitro . Further, HtrA is involved in immunopathology and apoptotic responses in the intestine during infection of mice in vivo [28, 29]. All these findings document a role of HtrA for the pathology associated with C. jejuni infection. However, the exact secretion mechanism of HtrA is as yet not fully understood. It remained also fully unknown how many HtrA molecules can be secreted by the bacteria during culturing and infection. Here, we quantified the amount of HtrA molecules secreted over time as calculated per single bacterial cell. This represents the first quantification report of a virulence factor secreted by C. jejuni. The presented data provide new insights into the secretion efficiency of HtrA, which is a key step in the virulence pathway of C. jejuni. The serine protease HtrA is an important virulence factor of C. jejuni and also plays an prominent role in various cellular processes [18–21]. During infection, HtrA is secreted into the extracellular environment, where it enables C. jejuni to transmigrate through the paracellular space of the host’s gut epithelial cells by cleavage of cell adhesion proteins such as E-cadherin [19, 26]. 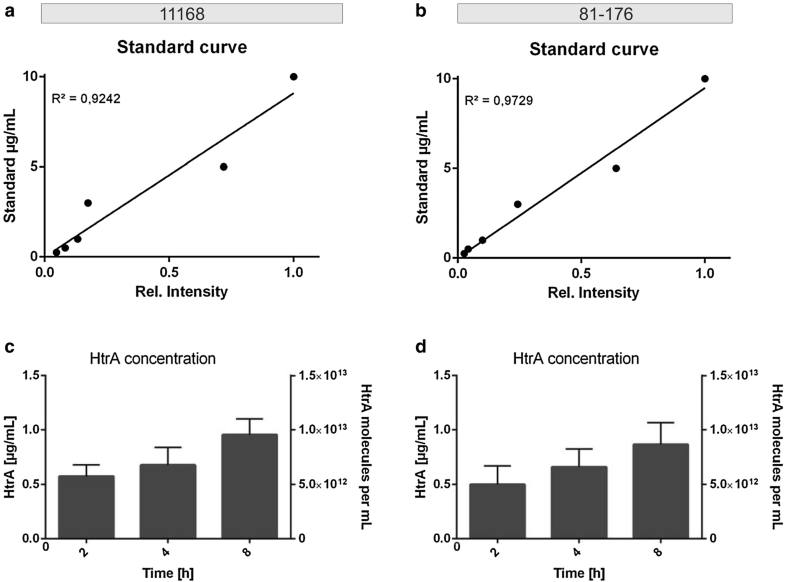 Although HtrA is an important pathogenicity determinant of C. jejuni, the amount of HtrA molecules secreted by the bacteria has never been determined. Therefore, in this study, we quantified the average number of HtrA molecules secreted per bacterial cell in a time course. This is the first time a secreted virulence factor of C. jejuni has been quantified. Our assay detects secreted proteins by means of quantitative Western blotting. Previously, we successfully used a similar approach to quantify the secretion of HtrA by Helicobacter pylori . 13099_2019_295_MOESM1_ESM.pdf Additional file 1: Figure S1. Purification of recombinant C. jejuni HtrA expressed in E. coli BL21. Important purification steps are shown, including purification by use of a GST-affinity column, exemplary wash and two elution fractions. The final purification step was performed via gel filtration, showing purified HtrA in fraction 2.